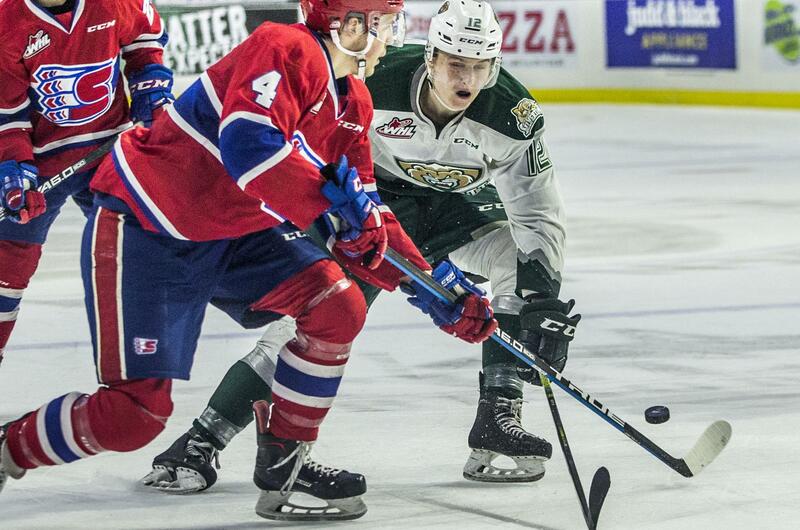 EVERETT – Eli Zummack scored his third goal of the playoffs and Bailey Brkin had 30 saves to help the Spokane Chiefs beat the Everett Silvertips 3-1 on Sunday and take a 2-0 lead in the best-of-seven series. Zummack, on the left side, took a pass from Jaret Anderson-Dolan, faked a shot and, after defenseman Artyom Minulin slid by, put away a top-shelf power-play goal to give Spokane a 2-1 lead heading into the third period. It was Brkin’s sixth win of the playoffs. After Wyatte Wylie opened the scoring at 16:01 of the first, Spokane’s Jake McGrew scored his first of the playoffs on a back-hander to make it 1-1 two minutes later. Luc Smith capped the scoring with an empty-net goal in the closing seconds, his second straight game with an empty-netter and his fourth goal overall in the playoffs. The Chiefs were outshot 31-17. Spokane, which is 4-0 on the road in the playoffs, will return home for Games 3 and 4 Wednesday and Friday. Published: April 7, 2019, 8:20 p.m.